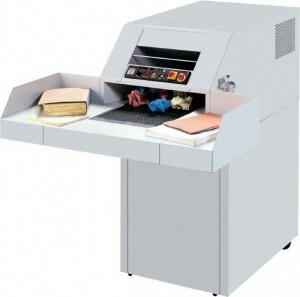 This 1/2" Strip-cut shredder takes up to 120 sheets per pass. The conveyor moves paper into the 16" wide shredding wheels at 60 feet per minute, then deposits the shreds into a large bin. Features built-in oiler and auto-reverse if overloaded.